Several interesting articles over the last month on the Rise of Robots and their intersection with Cloud Computing. An article on Google’s Ray Kurzweil about AI (Smart Data burst in the diagram above). Several articles (here and here) and open source project on software that connects robots to the cloud or the “World Wide Web for Robots”. 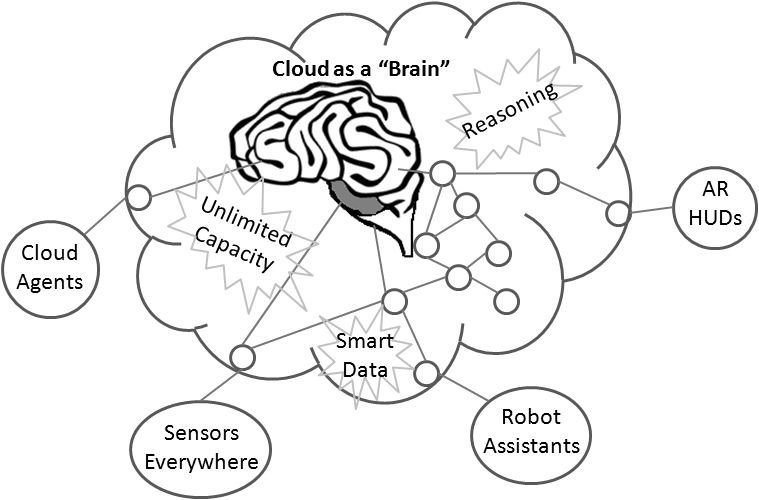 This relates to both the Cloud Agents and Robot Assistant bubbles in the diagram above. Robots are a great use case for the cloud because of their need for immediate situational awareness (especially with use cases like driving cars and auto-piloted drones).